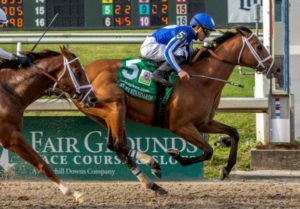 Alex and JoAnn Lieblong’s Bye Bye J moved wide to the leaders on the turn in Saturday’s $100,000 Rainbow Miss Stakes at Oaklawn Park, took charge after straightening away in the stretch and eased away to win by a length and three quarters. 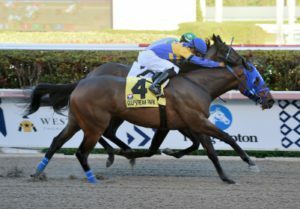 It’s the second stakes victory for the 3-year-old graded stakes placed daughter of Uncaptured, sold for $21,000 by Perrone Sales, Ltd., Agent for McDowell Farm, at the 2017 OBS Winter Mixed Sale. 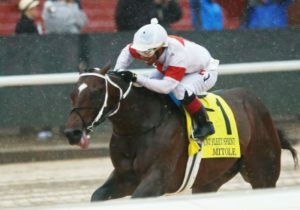 Trained by Ron Moquett, she’s now 7-4-1-1 and has earned $221,605 to date. 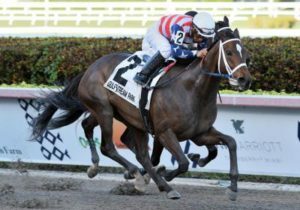 2018 OBS April graduates took both divisions of the New York Stallion Stakes at Aqueduct on Saturday. 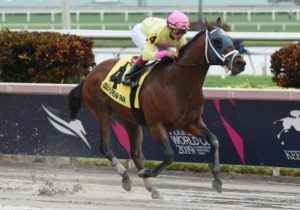 On the eve of the 2019 sale, OBS April graduates were first and third in a pair of Saturday stakes races. 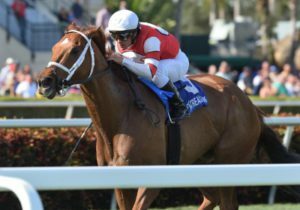 OBS graduates were 1-2 3 in a pair of stakes races on Florida Cup Day at Tampa Bay Downs on Sunday. 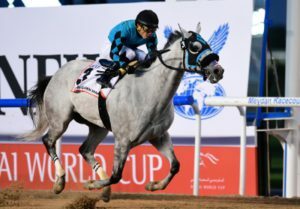 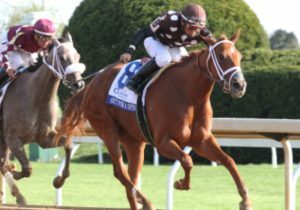 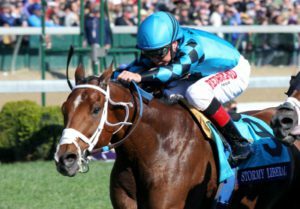 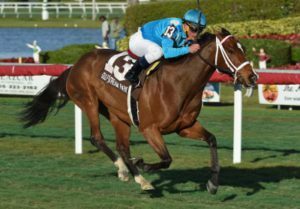 William Stiritz’s Wildwood’s Beauty took the $115,000 Stonehedge Farm South Sophomore Fillies Stakes, tracking fellow OBS graduate Eyeinthesky (October ’17) early and then charging past her in the stretch to a 3-1/2 length victory. 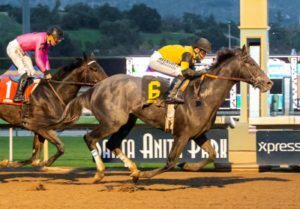 Here Comes Jackie (March ’18) was a neck back completing the OBS trifecta. 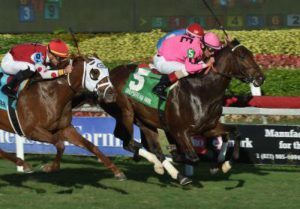 It was the stakes debut for the winner, a 3-year-old Florida-bred daughter of Kantharos, now 5-2-3-0 with $134,340 in earnings for trainer Scott Becker. 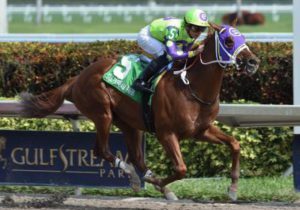 Consigned by Summerfield (Francis & Barbara Vanlangendonck), Agent, to the 2017 October Yearling Sale, she was purchased by Mr. Stiritz for $47,000. 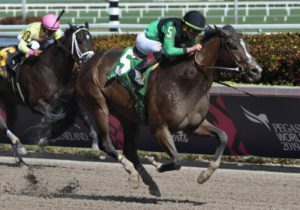 OBS Yearling Sale graduates dominated the $115,000 Pleasant Acres Stallions Distaff Turf Stakes, with Sabal Racing Stable’s Crown and Sugar surging three wide to the lead in the stretch and beating Bitacora (August ’15) by 2-3/4 lengths. 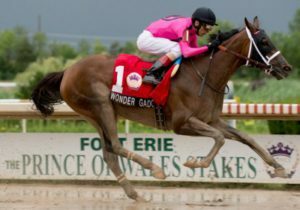 Supercommittee (August ’16) checked in third. 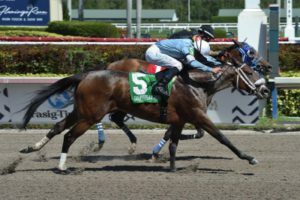 It’s the first stakes victory for the 4-year-old Florida-bred filly by Crown of Thorns, purchased for $1,500 out of the Woodford Thoroughbreds consignment at the 2016 August Sale. 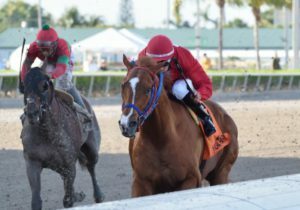 Trained by Darien Rodriguez, she’s now 23-11-1-1 and has earned $217,637 to date. 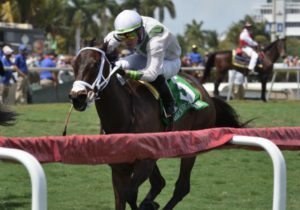 Michael Dubb, Madaket Stables LLC and Bethlehem Stables LLC’s World of Trouble made short work of his overmatched rivals in Saturday’s $150,000 Gulfstream Park Turf Sprint Stakes, leading from gate to wire and winning by 2-3/4 lengths in a race run on the main track due to the weather. 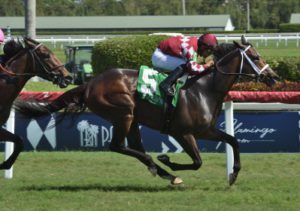 That’s five stakes wins for the grade one stakes placed 4-year-old Florida-bred colt by Kantharos, consigned by Darsan Inc., Agent, to the 2016 August Yearling Sale. 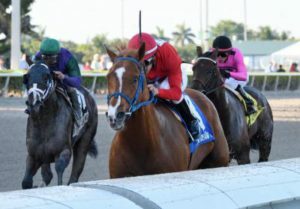 Now 10-6-2-1 for trainer Jason Servis, he has earned $671,400 to date. 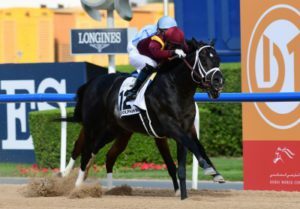 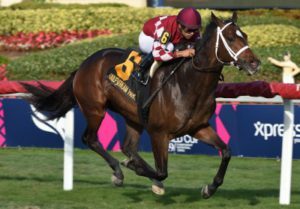 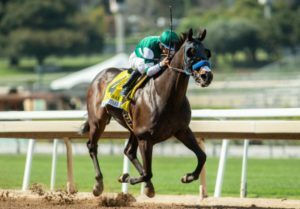 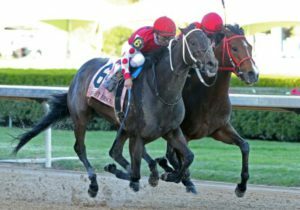 OBS 2-year-old sale graduates Shamrock Rose and Stormy Liberal have won 2018 Eclipse Awards. 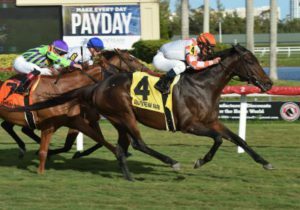 OBS graduates posted three stakes wins at Gulfstream Saturday on Sunshine Millions Day. 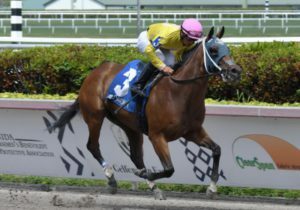 OBS graduates posted a pair of stakes wins at Gulfstream Park on Saturday. 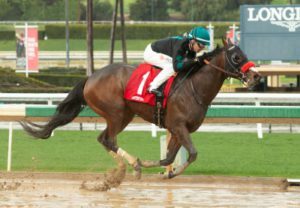 LRE Racing LLC and JEH Racing Stable LLC’s Casa Creed stalked the pace in the $100,000 Kitten’s Joy Stakes, fought to take the lead in deep stretch then held off a late charge by fellow OBS graduate Henley’s Joy (April ’18) and beat him by a neck. 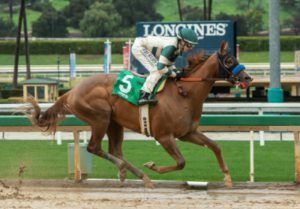 It’s the first stakes victory for the 3-year-old colt by Jimmy Creed, purchased for $15,000 out of the Janie Roper consignment at the 2017 Winter Mixed Sale. 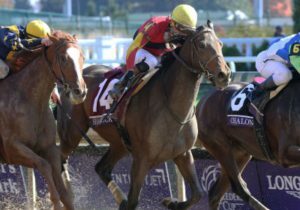 Trained by Bill Mott, he’s now 5-2-0-0 and has earned $111,408 to date.